Plants are multicellular, photosynthesizing members of the Eu-karya—the domain of organisms with a eukaryote cell type that also includes animals and fungi. Most plants are green, although a select few genera have lost their green pigment during the course of their evolution. During photosynthesis, the green pigment chlorophyll that is found in plant cells uses energy from sunlight to transform carbon dioxide and water into organic compounds, including free oxygen. Land plants are most responsible for altering the face of the Earth into a habitable environment for other organisms. Through the process of converting solar energy, carbon dioxide, and water into other organic compounds, plants are in actuality the key source of stored energy used by humans in such forms as coal and oil. 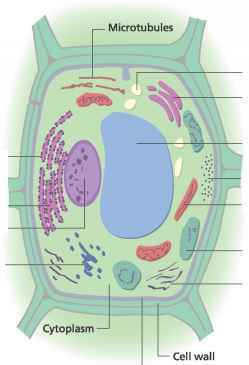 The eukaryote cell of a plant, one function of which is photosynthesis. composition of these organisms' genetic relationships. Green algae are genetically linked to the earliest land plants and can arguably be classified as either plants or protists. Nonvascular plants include mosses and hornworts. stems and leaves to transport water and food. 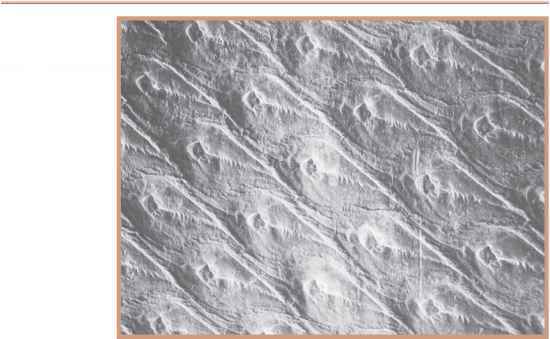 Nonvascular plants lack vascular tissue and a conducting system; instead, they absorb water and nutrients through a sparse layer of specialized absorbent cells. • Nonvascular plants, including mosses, liverworts, and hornworts. These plants are found in damp, shady places and cannot survive for long in areas that dry out for long periods. The water-absorbing cells of these plants can be highly efficient. Sphagnum peat moss can absorb up to 25 times its weight in water. There are about 16,600 living species of nonvascular plants. Nonvascular plants were the first land plants and rose during the first half of the Paleozoic Era. The earliest widespread land plants were probably of this variety. • Seedless vascular plants, including club mosses, ferns, whisk ferns, and horsetails. There are about 12,400 living species of seedless vascular plants. Seedless vascular plants rose to dominate the second half of the Paleozoic Era. Seedless vascular plants include ferns and horsetails. • Gymnosperms. These are seed plants with a protective cone or other body for their seed embryos. Gymnosperms do not produce fruits or flowers. Conifers (evergreen trees), seed ferns, and cycads are found in this group. There are about 600 known living species of gymnosperms. Gymnosperms first appeared in the latter Paleozoic Era but became dominant during the Mesozoic Era. • Angiosperms, the flowering plants. The angiosperms were the last of the great plant lineages to evolve; but today, they dominate the Earth, with more than 250,000 known living species. These plants utilize flowers to attract pollinators and also encase their seeds in fruits that, when separated from the plant, can aid in the dispersal of seeds. Angiosperms rose during the Late Mesozoic and became the dominant form of land plant during the Cenozoic Era.